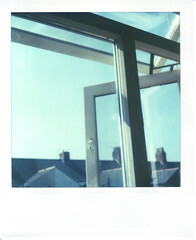 i was lying on the bed looking out at yet another beautiful blue sky and thinking about the white window frames overlapping and reflecting each other and it reminded me of the white frame around a polaroid. this is on proper sx-70 film, i'll ration the rest of it for less banal shots but i had no idea whether this pack would be any good at all (expired and opened) so i thought there was no harm in trying it out, plus i was itching to see those blues. this has transferred least successfully of all my polas so far to digital, since the beauty in the shot is in the subtle qualities of the film and i'm not doing so great at replicating that subtlety. i would say the original image is more saturated and sharper than the one i see on my laptop screen.